Creeping change is the accumulation of small changes that are gradual in nature, unseen and not planned, but can add up to a significant change. They may be difficult to detect and monitor using conventional hazard identification (HAZID) studies and risk assessments. This publication provides a methodology to identify creeping changes, including a set of keywords. 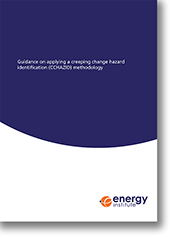 The CCHAZID methodology covers both engineering (including process safety; mechanical engineering, and electrical, control and instrumentation (EC&I)) and human/organisational changes. This technical publication also provides guidance on application of the CCHAZID methodology comprising the required participants, timescales and documentation, and contents of the outputs. Also provided are the findings of trials of the CCHAZID methodology, which were used to further develop the CCHAZID methodology. These indicate the thought processes and outputs of the three pilot studies carried out at diverse energy industry facilities. The CCHAZID methodology could be applied to any ageing plant or to plant with many or compound changes. Whilst it was piloted in and based on knowledge from high hazard industries it could be applied wherever there is a reliance on ageing equipment. The CCHAZID methodology is not solely for safety risks; it is also applicable to environmental and business risks. The CCHAZID methodology should form part of the suite of safety studies used to regularly review plant. The CCHAZID methodology was developed to be a formal safety study conducted in a similar manner to a conventional HAZID; however, its keywords could be used as a checklist during reviews or in more informal discussions. It is not intended that a CCHAZID study replaces a conventional HAZID study; they are complimentary techniques. Moreover, the CCHAZID methodology is complementary to OGUK Cumulative risk guidelines, in that it allows deviations to be identified.